SharePoint is a great collaborative environment. Our work teams love to share information and documents using an easy, intuitive web interface. It would be great if there was a way to get automatically notified whenever someone else changes or adds information. Is there a way to do that? Yes! 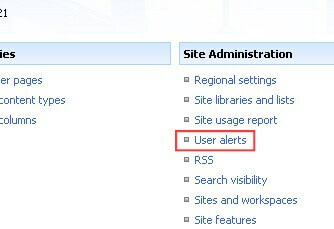 The simplest way is to use the built-in SharePoint alert system. 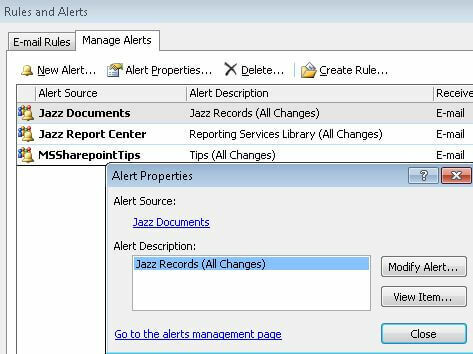 SharePoint alerts allow users to selectively choose a library or list (or even an individual document or list item) to receive alerts from. Alerts come in the form of an email notification with a brief description about the item along with a link to it. 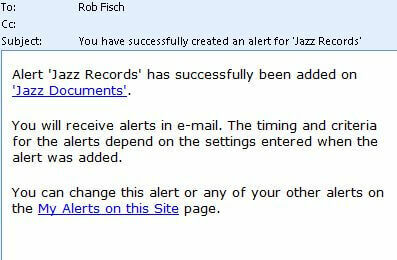 In this example, a document library called "Jazz Records" is used. 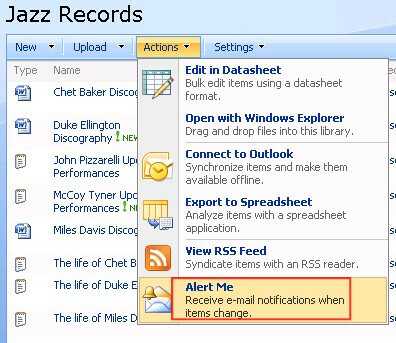 The user clicks on the "Actions" menus and selects "Alert Me". The user decides on which alert options are suitable. It's tempting to choose "immediately", but unless it's a time critical function, daily or weekly summaries work quite nicely. These options are editable afterwards, so not to worry. 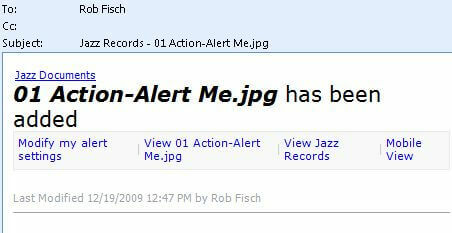 After (anyone) uploads a ..jpg image called "01 Action-Alert Me.jpg, the user receives an email alert informing them that a new document has been "added", with various useful links. Now here's the big surprise! 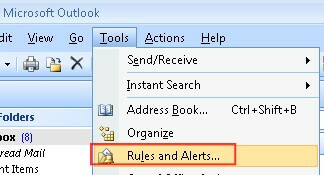 In Outlook, select "Rules and Alerts..." from the "Tools" menu. 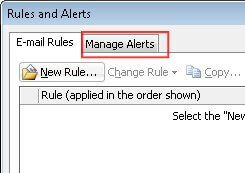 Normally Outlook rules are managed here. I never thought anything about the "and Alerts..." until I stumbled on this one day. 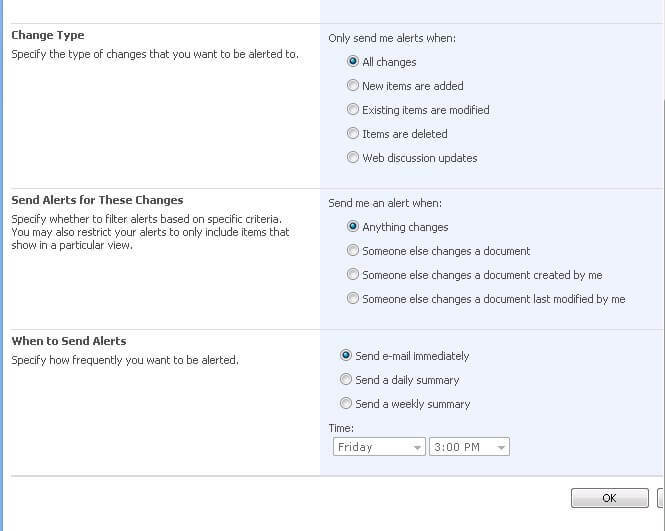 Alas, all SharePoint Alerts are displayed in one option-filled management screen, right in Outlook! 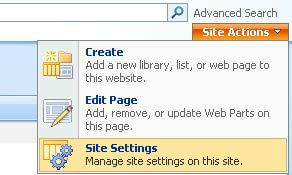 If a site administrator wants to review and edit alerts that were created on a particular site, they go into "Site Settings". Choose the user from the drop down and click "Update". This shows the resource (in this case a document library) and the frequency of the Alert. Administrators can delete user alerts from this page.